The SnapBridge app can be used for direct Wi‑Fi connections that do not require you to first pair the camera and smart device. See here for information on the cameras that support this feature. To use these features, exit Wi‑Fi mode and pair the camera and smart device via Bluetooth. 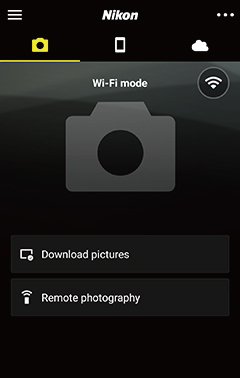 Wi‑Fi mode cannot be enabled while pictures are being downloaded from the camera. After downloading pictures or interrupting transfer, wait at least three minutes before switching to Wi‑Fi mode. 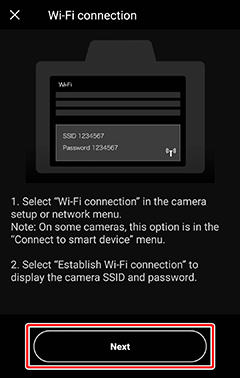 Follow the steps below to connect to a Z mount camera via Wi‑Fi. 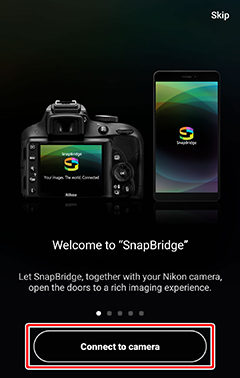 Smart device: Launch the SnapBridge app. If this is the first time you have launched the app, tap Connect to camera and proceed to Step 2. No “Connect to Camera” Button? If you tapped Skip or have previously launched the SnapBridge app, tap in the tab, select Wi‑Fi mode, and proceed to Step 3. Check that the SnapBridge app is up to date. If you are using the latest version and the Wi‑Fi mode option is still missing, exit the app, confirm that it is not running in the background (the procedure varies with the smart device; see the documentation provided with your device for details), check that the device is connected to the Internet, and then re-launch the app. 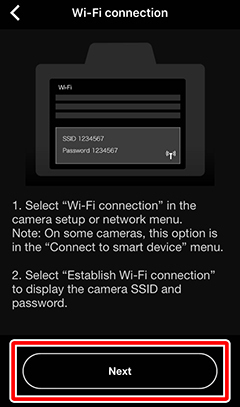 Smart device: When prompted to select the camera type, tap mirrorless camera and then tap Wi‑Fi connection. Check that the SnapBridge app is up to date. 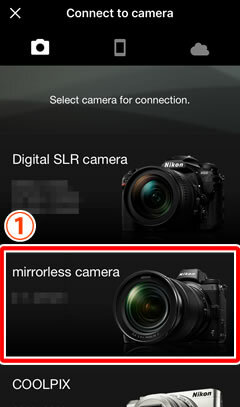 If you are using the latest version and the mirrorless camera option is still missing, exit the app, confirm that it is not running in the background (the procedure varies with the smart device; see the documentation provided with your device for details), check that the device is connected to the Internet, and then re-launch the app. Smart device: The smart device will instruct you to ready the camera. Turn the camera on. Do not tap Next until you have completed Steps 4–5. 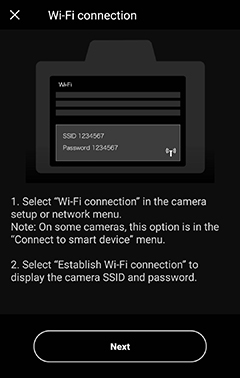 Camera: Highlight Wi‑Fi connection in the camera menus and press J (on some cameras, Wi‑Fi connection is in the Connect to smart device menu). Camera: Highlight Establish Wi‑Fi connection and press J. The camera SSID and password will be displayed. Note that some cameras will not display an Establish Wi‑Fi connection option, in which case you should enable Wi‑Fi and proceed to Step 6 (see the camera manual for details). Smart device: After completing Steps 3–5 on the camera, return to the smart device and tap Next. Smart device: After reading the instructions displayed by the smart device, tap View options. The smart device Wi‑Fi settings dialog will be displayed. Smart device: Enter the camera SSID and password (the SSID and password can be viewed in the camera menus; for more information, see the camera manual). Wi‑Fi mode options will be displayed once a connection is established. You will not be required to enter the password when next you connect to the camera unless the password has changed in the interim. Smart device: Wait for the smart device to connect. The connection is complete once Wi‑Fi options are displayed. : The SnapBridge app is in Wi-Fi mode without a Wi-Fi connection to the camera. : The smart device is connected to the camera via Wi-Fi. Follow the steps below if your camera is not a Z mount mirrorless model. Smart device: Launch the SnapBridge app and tap Skip (if you have launched the app before, this dialog will not be displayed; proceed to Step 2). Tap in the tab and select Wi‑Fi mode. Smart device: Tap Wi‑Fi connection when prompted. The smart device will instruct you to ready the camera. Do not tap Next until you have completed Steps 4–5. Camera: Turn the camera on. Highlight Wi‑Fi connection in the camera menus and press J (on some cameras, Wi‑Fi connection is in the Connect to smart device menu). Smart device: After completing Steps 4–5 on the camera, return to the smart device and tap Next. If you are unable to connect via Wi‑Fi, try again after reading this. After downloading pictures or interrupting transfer, wait at least three minutes before switching to Wi‑Fi mode. 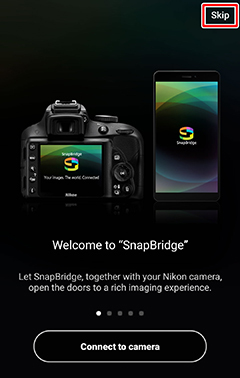 iOS device: Launch the SnapBridge app. If this is the first time you have launched the app, tap Connect to camera and proceed to Step 2. Check that the SnapBridge app is up to date. 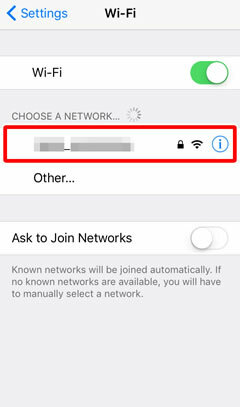 If you are using the latest version and the Wi‑Fi mode option is still missing, exit the app, confirm that it is not running in the background, check that the device is connected to the Internet, and then re-launch the app. 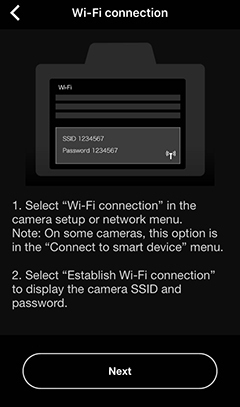 iOS device: When prompted to select the camera type, tap mirrorless camera and then tap Wi‑Fi connection. Check that the SnapBridge app is up to date. 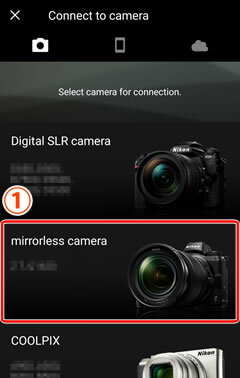 If you are using the latest version and the mirrorless camera option is still missing, exit the app, confirm that it is not running in the background, check that the device is connected to the Internet, and then re-launch the app. iOS device: The smart device will instruct you to ready the camera. Turn the camera on. Do not tap Next until you have completed Steps 4–5. iOS device: After completing Steps 3–5 on the camera, return to the smart device and tap Next. 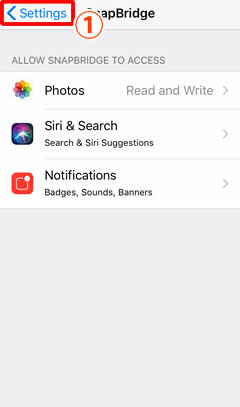 iOS device: After reading the instructions displayed by the smart device, tap View options to launch the iOS Settings app. iOS device: Tap < Settings to open the “Settings” app. Next, scroll up and tap Wi-Fi, which you’ll find near the top of the settings list. iOS device: Enter the camera SSID and password (the SSID and password can be viewed in the camera menus; for more information, see the camera manual). Wi‑Fi mode options will be displayed once a connection is established. iOS device: Wait for the smart device to connect. The connection is complete once Wi‑Fi options are displayed. : The iOS device is connected to the camera via Wi-Fi. iOS device: Launch the SnapBridge app and tap Skip (if you have launched the app before, this dialog will not be displayed; proceed to Step 2). 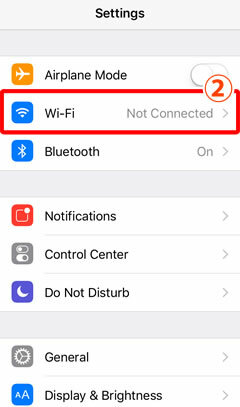 iOS device: Tap Wi‑Fi connection when prompted. The smart device will instruct you to ready the camera. Do not tap Next until you have completed Steps 4–5. iOS device: After completing Steps 4–5 on the camera, return to the smart device and tap Next.